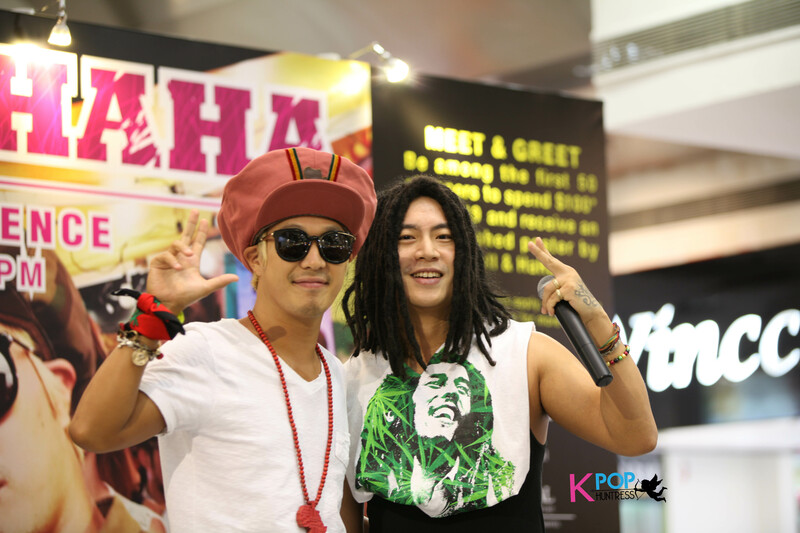 Skull & Haha arrived at 7pm sharp with hoards of screaming fans waiting for them at Square2, Novena mall, Singapore. Haha waved his hands and greeted the crowd as he traveled down the escalator with Skull following behind. 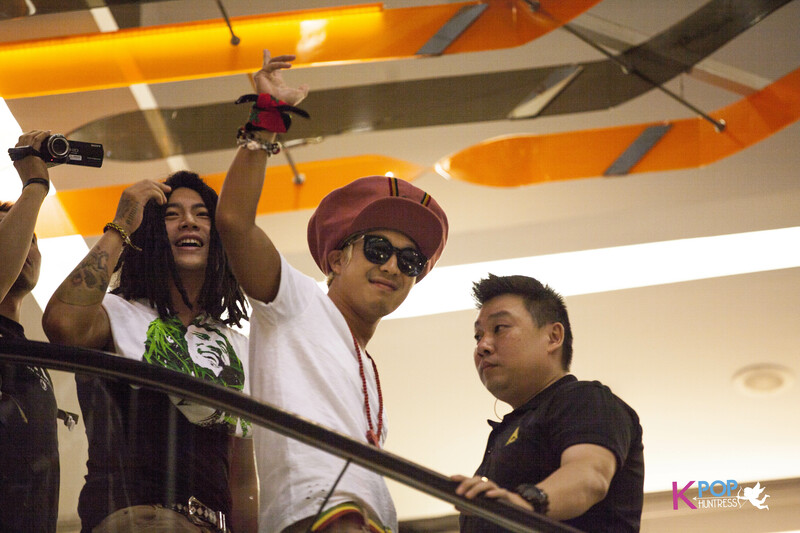 Both seemed really enthusiastic and happy to be in Singapore and wasted no time to greet the crowd who had been waiting for them since as early as4pm. The MC mentioned to the crowd that both of them were here to meet the beautiful girls of Singapore, to which Skull reiterated through his microphone that they were indeed waiting to meet the beautiful girls of Singapore – this sent female fans screaming! After a quick photo opportunity session by the members of the media, the press conference was kicked off with questions being fielded by the media. When asked if reggae music was not their first career choice, what else would they be doing to which Haha replied that Skull would be doing something hair-related like braiding people’s hair, whilst Skull said Haha would be in the food business. Apart from doing music together, Haha shared that both of them work together and get along very well musically and given the opportunity, Haha would like to work with idols whilst Skull would like to work with Singapore girls. 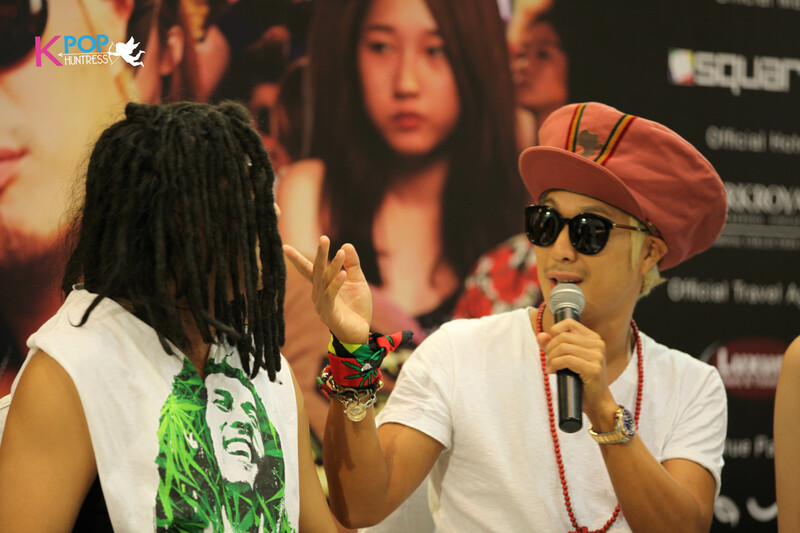 Skull also shared that they had a hard time making songs into reggae given the rather low acceptance of reggae genre music in Korea. However, they’re happy that they still receive the love and support from fans from all over as seen by those who turned up at today’s press conference as well. On the subject of Running Man, Haha shared that he did not expect Running Man to be so popular outside of Korea and he felt it was the first Thailand episode which gave Running Man its international status. Skull also jokingly shared that he was jealous of Haha’s popularity but is still thankful to him, nonetheless. Skull has also participated in Running Man before this and he loves it. Skull also mentioned that Haha looks tougher than what his exterior shows in that he can hold his alcohol really well! Haha on the other hand shared that Skull has a really good body and those going to watch them perform tomorrow will be in for a big surprise! One of the last questions asked was why did Haha dye his hair blonde. Haha responded funnily that as he’s now married he needs to take care of himself and the reason why it’s blonde was to cover his whites! He also jokingly said it will return to ‘normal’ soon enough. We would like to thank the good people at LEAP IMS for giving us the opportunity to cover the press conference.